Featured In A Dateline Special As The Most Potent Physical Attraction Pheromone which comes in an unscented version for women. This unscented pheromone product is ranked #2 in 2018 Top Rated Pheromone Perfumes and contains 11mg of powerful pheromones that will capture his attention and won’t let go. When you step into the nightclub wearing your best outfit, make-up and this secret weapon, you can be sure you’ll be surrounded by gentleman callers who want you all to themselves. 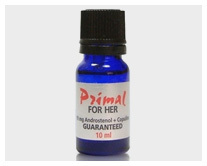 Primal Instinct for women has a guaranteed 11 mg Androstenol plus Copulins unique formula in an oil base and has almost no pheromone smell. It can be used on its own or mixed with your favorite perfume. SCENT: Odorless and mixes well with your favorite perfume. 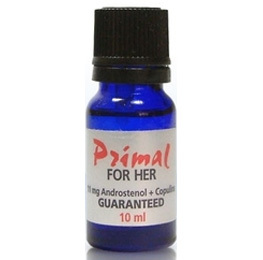 This pheromone oil is known for it’s beneficial effects in the world of romance. BENEFIT: Very effective getting the attention of men in social situations. Women find men more friendly and social. Very potent and effective. SUMMARY: Primal Instinct was featured on a Dateline special as the most potent pheromone product on the market. Customer reviews indicate that this is a great product for attracting men and getting lots of attention. Dateline States Most Potent Pheromone! 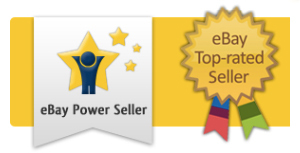 Most Publicized And Popular Pheromone! Guaranteed 11 mg Androstenol plus Copulins! Primal Instinct Women’s Unscented Pheromone product has been featured on Dateline as the most potent pheromone product on the market. When you have the primal instinct, you want to be close and intimate with others. If you’re looking to attract that certain guy you’ve been eyeing, this unscented pheromone product will hit him like cupid’s arrow and make him want to be close and intimate with you. This unscented pheromone product is ranked #2 in 2018 Top Rated Pheromone Perfumes and contains 11mg of powerful pheromones that will capture his attention and won’t let go. When you step into the nightclub wearing your best outfit, make-up and this secret weapon, you can be sure you’ll be surrounded by gentleman callers who want you all to themselves. Just a couple of drops on your pulse points before stepping out the door and you’re sure to receive lots of attention. Men will compliment you, open doors for you, flirt with you and want to take you out and get to know you better. This pheromone product for women puts you in control but makes the man feel as though he’s the one steering the ship. Primal Instinct is your little secret for getting him from point A to point B fast! !